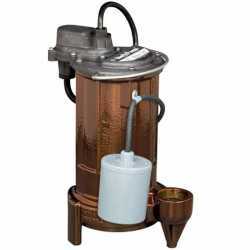 The 281-3 from Liberty Pumps is an Automatic Sump/Effluent Pump w/ Wide Angle Float Switch, 1/2HP, 35' cord, 115V. It has a single phase permanent split capacitor motor at 1/2HP and a 35ft-long power cord. This Liberty effluent sump pump produces a max flow of 20 GPM at 30' and has a shut-off head of 37'. This effluent sump pump operates at 115V, 8.5 Amp and 60 Hz with a max fluid temperature of 140F. The Liberty 281-3 sump/effluent pump has a 1-1/2" discharge and can handle solids up 3/4. This sump/effluent pump covers a wide range of low-head to mid-head pump applications. The Liberty 281-3 sump/effluent pump is ideal for pumping of drainage, effluent and waste water, and other non-corrosive/non-explosive liquids.